Las Vegas is still recovering from the Great Recession and that means thousands of homes remain abandoned, foreclosed and unoccupied. Neighborhoods with these types of properities are prime targets for squatters. Up until last year, getting rid of the unwelcome strangers was a huge task in the state of Nevada. If squatters produced a lease (even if it was clearly a fake one) and there was no evidence of breaking and entering, it was considered a civil dispute. Fortunately that's all changed and there's now a law on the books to help stop squatters. Nevada Assembly Bill 386 gives police the power to promptly remove squatters. Before the law was passed late last year, the eviction process could take weeks or even months. The first offense is a gross misdemeanor, while any additional violations of the law are class-D felonies, punishable with a fine and/or up to four years behind bars. Since the anti-squatting law went into effect (October of 2015), Las Vegas Metro Police says it has taken over 110 squatters reports and arrest roughly two dozen violators for housebreaking and/or unlawful occupancy. What should you do if squatters move into your area? The first thing you want to do is be proactive. If there is an unoccupied home in your neighborhood, be on the look out for signs of squatters. These signs could include broken windows/doors (used to gain entry), tents on the property, clothes lines, small fires burning inside or around the house, and of course people coming and going regularly. Next talk to neighbors and share your concerns/thoughts. If anyone knows the homeowner's contact information, give them a call to see if they know about the occupants. If you notice the squatters seem to be using utilities on the property, give the companies a call to notify them of illegal use. Sometimes the owner or previous occupant did not properly turn off the service. By turning utilities off it may just scare themaway. Contact the police. Officers can inspect the property and talk to anyone there. If they believe the people to be squatters, then the people can be removed or arrested. Plus, if any legal actions are taken down the road, having it on record that you contacted the police could be useful. If all else fails and squatters are causing havoc in your neighborhood, or the property owner is slow to respond, it may be time for legal action. 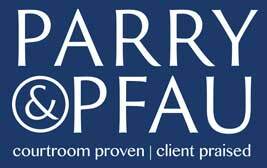 Call Parry & Pfau for a free consultation and we'll let you know if you have a good case. Older PostIs It Legal to Burn the American Flag?